This toilet is based on The Humanure Handbook by Joseph Jenkins. Notes are made by Asphyxia and may contain errors! 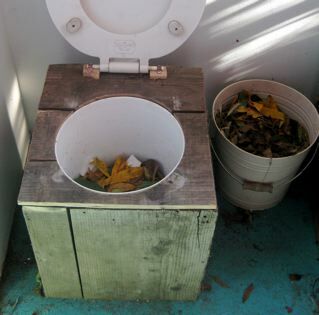 The basic idea for this toilet is that you poo into a bucket, cover your poo with “cover materials” (such as leaves, soil, sawdust) to prevent smell, and when the bucket is full, you put a lid on it and start using a new bucket. When you have two full buckets, you empty them both into your compost pile, and cover them with “coarser cover materials” (this can be straw, leaves, weeds, and doesn’t have to be as fine as the ones going into the bucket). After a year, start a new compost pile. After another year, you can use your compost from the original pile in the garden – no need to turn it. To make the poo-into-a-bucket experience more pleasant, you can place the bucket inside a box that has a hinged lid (to enable you to remove the bucket), with a toilet seat placed on top. This method IS hygienic, and neither the toilet nor the compost pile smell bad. Get 4 identical 20-litre buckets with lids. Keep one in the toilet box for current use, two in the toilet room, and one spare. Find a source of cover materials: autumn leaves (oak leaves are ideal), rotted sawdust (not kiln-dried or chemically treated), peat moss, leaf mould, grass clippings, soil, ripped newspaper. Keep in a bucket for these in the toilet room. 2 adults and 1 child go through approximately a 20 litre bucket of cover materials per week. Collecting 10 garbage bags worth of autumn leaves each year would probably do it. Source coarser cover materials: straw, leaves, weeds, newspaper. Keep a pitchfork and a hose at the compost heap. Optional: keep a long-handled toilet brush there too. and the toilet seat. Make sure the wooden hinged lid has a circle cut from it so that the top of the bucket can protrude right up the the toilet seat. This stops people from accidentally wee-ing onto the floor of the box. 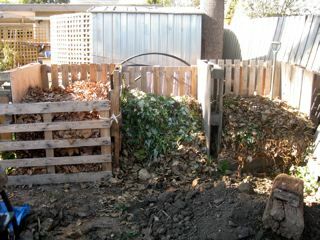 Build a three-chambered compost heap. Each chamber should be approximately one cubic metre. The simplest way to do this is to use stakes tied to old wooden pallets – three across the back, and four to create the sides of the heaps. Wee or poo into the bucket and cover it with cover material. Add food scraps, if desired, and cover with cover material. An entire bucket of cover material is needed for every toilet bucket, as the poo/wee simply fills the airspaces. To save cover materials, you can wee in the garden instead. Or wee into a separate bucket, and each day tip it into your watering can, top up with water, and choose which plants will receive the fertiliser. 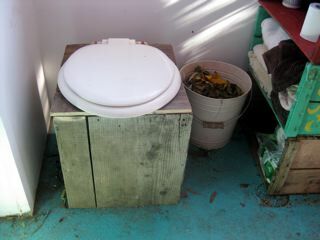 (See photo of my outdoor wee toilet.) If weeing into the toilet, use some sawdust to balance the nitrogen. Using autumn leaves with poo is a good balance. Ie, if you do a wee, put in sawdust; if you do a poo, put in autumn leaves. We – 2 adults and a child, home full time – fill a 20 litre bucket in 5 days. Gather a handful of mint or other weed (optional – can use a toilet brush instead). 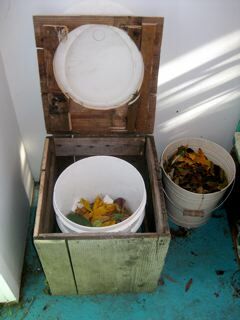 Carry both full buckets to the compost heap. With the pitchfork, rake a depression in the middle of the current compost pile and deposit contents of both buckets into the pile. Rake the initial contents back over the top to cover the poo. Now cover the compost pile with an additional layer of coarser cover material, in order to eliminate odors and to entrap air as the pile is built. Leave the pile quite flat on top. If the compost pile smells, cover it with more coarser cover materials. Rinse the bucket with water and scrub it with the mint/weeds (or use a long-handled toilet brush). Use soap if desired. Tip the dirty water and weeds onto the compost pile. Return the buckets to the toilet room and put an inch of cover material on the bottom of each bucket. Use a three-chambered compost bin made out of pallets. Use the two outermost bins for compost, and the middle one for storage of coarser cover materials, which will be layered on top of the current pile after a deposit is made. Kat uses ex-olive drums, with holes cut in the bottom for drainage. Start a new compost pile in one of the outer bins with a 40cm layer of hay or straw, grass clippings, leaves, and/or weeds. Place the first full poo bucket from the toilet directly on the top center of this. Cover immediately with more newspaper, straw, hay, weeds, or leaves. Use this bin until it is full – probably after a year. Then cover it with a thick layer of straw, leaves, grass clippings, or other clean material (without weed seeds) to insulate it. Leave it to rest for a year while filling the other outer bin. 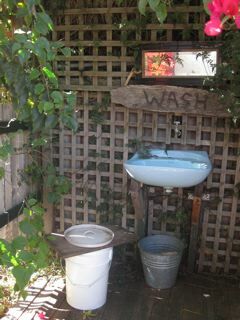 When the other bin is full, the contents of the first one can be placed on the vegie gardens and fruit trees. As well as putting poo into the compost, be sure to include all food scraps including meat, fat and oil, animal manure, dead animals and garden waste. Don’t put in lime or wood ash. Don’t let chooks, mice or other animals get into the pile. After about ten years, the plastic bucket may begin to develop an odor, even after a thorough washing. Replace odorous buckets with new ones in order to maintain an odor-free system. The old buckets will lose their odor if left to soak in clean, soapy water for a lengthy period (perhaps weeks), rinsed, sun-dried, and perhaps soaked again, after which they can be used for utility purposes (or, if you really have a shortage of buckets, they can be used in the toilet again).